Visitors to the Jackson’s Mill Jubilee wander among exhibits at Jackson’s Mill, W.Va. Photo courtesy Lewis County CVB. The annual Jackson’s Mill Jubilee at historic Jackson’s Mill, West Virginia, will feature a new layout in 2018, a spokesman for the organization announced, also addressing rumors that the event had been cancelled. 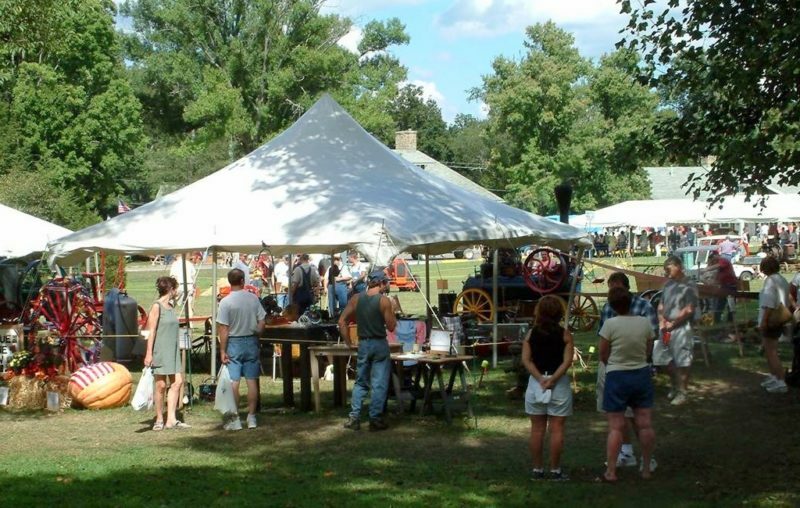 The festival, which attracts 10,000 visitors to historic Jackson’s Mill near Weston, in Lewis County, is one of three celebrations that bring thousands of visitors to the region that weekend. “Contrary to what you may have heard, there will be a Jackson’s Mill Jubilee in 2018. It was close,” Vaughn said. “We had a couple of days of rain…and we barely broke even, but we managed to pay all our bills. He said the organization has also decided to invest in improvements to the event. The event is part of one of the biggest travel weekends in Lewis County, according to Chrissy Richards, executive director of the Lewis County Convention & Visitors Bureau. “The same weekend the Jane Lew Arts & Crafts Festival is being celebrated in Jane Lew, and the Italian Heritage festival is going on in Clarksburg. And people come to attend all three,” Richards said. Vaughn said parking will remain free and admission will remain $5 per adult, and children under three will be admitted free. “The biggest change will be in the look. Visitors won’t have to walk a mile to see everything, although free golf-cart rides will still be available to those who need them,” he said. Now a state fair and festival ground, Jackson’s Mill is the childhood home of General Thomas “Stonewall” Jackson.